Art Gallery Cards: Flamingos and Sea Shells! 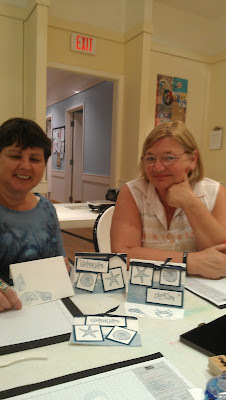 Here are Helen and Lavinia with our finished Bee-yooo-tee-ful sea shell cards. Clean and simple. What is difficult to see is the hazy, sparkly finish created by gluing (yes) a used dryer sheet over the blue "sea" and sprinkling very fine iridescent glitter over the dryer sheet. Here's project #2! We used blender pens to color our flamingos and their cute straw hats! These ladies are so artistic! I love that they are all the same, yet different here and there! The beauty of art!! 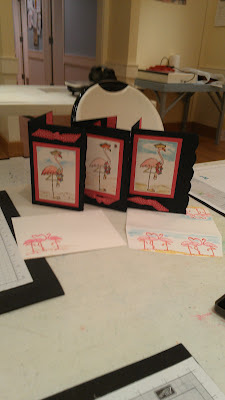 Next week a beautiful butterfly easel card and another lovely greeting card! Email Ree at reenathan@bellsouth.net to reserve your seat! !